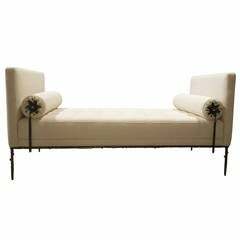 Rhapsody is a comfortable yet equally precious daybed to pleasantly accompany moments of relaxation. 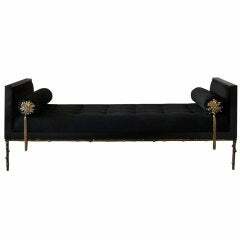 From the formal viewpoint it is inspired on one of the most recognizable models, which possibly represents the quintessential idea of a sofa: the Edwardian English Chesterfield. Simplified to achieve greater linearity, yet endowed with generous proportions, Rhapsody retains its lavish deep-button upholstery and the pleated effect of its armrests which, increased in scale to the extent that they touch the ground to replace the feet and even incorporate the headrests in their profile, have become its most distinctive features. The leather upholstery is entirely hand crafted and represents the highest expression of artisanal artistry. Made in Italy. Dimensions: 260 x 106 x H 60 cm. The leather is available in the colors of Modica brown, Etna black, Stromboli red, Dijon Yellow, York green. Other customizations available upon request.